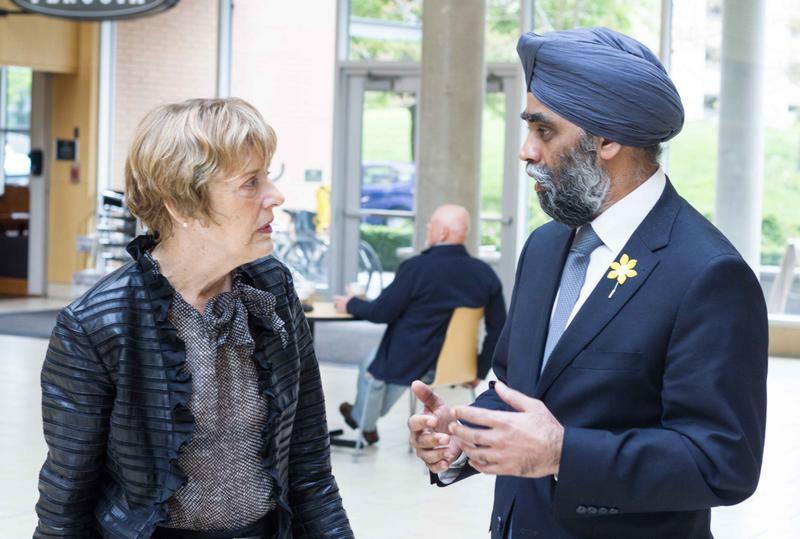 Harjit Sajjan, Canada's Minister of National Defence, speaks with UBC's interim president, Martha Piper. Harjit Sajjan, the Minister of National Defence, announced the long-awaited John R. Evans Leader’s Fund (JELF) at a press conference Friday morning in the absence of Kirsty Duncan, Minister of Science. The $1.5 million fund, from the Canadian Foundation for Innovation (CIF), will be used for scientific research and infrastructure, and will go to 14 projects at UBC in the hopes of pushing Canada and Canadian researchers forward in the scientific community. Sajjan opened his speech reminiscing about his times in Vancouver. “It’s always a pleasure when we have representatives from the government coming to UBC carrying bags of money with them, to hand out to our deserving researchers,” said John Hepburn, UBC’s Vice-President, Research and International. This fund seeks to help UBC in its endeavours to attract and attain the very best of today’s and tomorrow’s researchers. According to Sajjan, Canadian researchers contribute four per cent of the world’s most cited research papers, an impressive number considering Canadians only account for 0.5 per cent of the world’s population. Sajjan added that this is just the start of attracting top talent. One of the recipients of the fund, Janel Kopp, who received over $125,000 for new equipment, is currently investigating the cellular and molecular mechanisms underlying pancreatic cancer, the fourth leading cause of cancer-related deaths in Canada. “I’m truly honoured here to have the ability to promote science, to applaud our scientists, and to celebrate science’s rightful place in government. I’m pleased to be part of a government that believes in the importance of science, that believes that scientific knowledge should inform decision-making, and that understands that science is more important for prosperity, health, environment, and quality of life, than ever before." See a full list of research that is being funded here.